Amish Fireplaces have received much attention in the media. For example, they’ve been featured in full-page spreads in USA Today and other newspapers. Often, the stories are accompanied by photos of diligent Amish craftsmen building the mysterious fireplace, as if by magic. In Choosing a Deluxe, Amish-Crafted Fireplace, we will present an overview of the various types of Amish-crafted fireplaces available to homeowners. And they’re from Brandenberry Amish Furniture. Skilled Amish cabinetmakers build the wooden section of each fireplace. Then, the craftsmen install the Fire F/X or Dimplex Fame insert. And, the fully programmable, remote controlled inserts create a warm, cozy environment everyone will love. Brandenberry offers an extensive lineup of different types of Amish fireplaces and mantels. Also, the designers create a variety of styles to fulfill homeowners’ divergent decorator and entertainment needs and desires. Traditional fireplaces, like the Charleston, Felix and West Lake fire up the aura and visual appeal of any living space. Corner units – such as the Modesto and Regal Corner Fireplace — convert a corner of a homeowner’s living room or den into the ‘hottest,’ most inviting place in the home. Media console or entertainment center fireplaces feature CD/DVD storage plus all the traditional fireplace features. The Bryant Fireplace Media Console and the DN Fireplace Media Console are two of the many entertainment center units available. 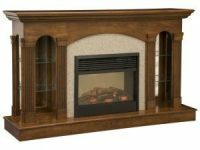 Plus, the Jefferson Entertainment Center with Fireplace and Bookcase is a wall unit with a fireplace. The Curio Fireplace fulfills your desire for a fireplace and curio cabinet rolled into one. Movable Fireplaces, such as the Valley Fireplace can be rolled from room to room. So they bring warmth, romance and good times to wherever in the house a homeowner needs it. Homeowners can choose a variety of custom options. So they can create a fireplace that’s uniquely theirs. For example, they can choose the wood species, stain and paint. Plus cool features like a mantle lift for a pop-up TV. Or a swing-out media storage on some units. 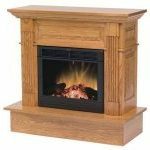 What’s more, homeowners can find the full lineup of Brandenberry’s fireplaces and mantles at the Brandenberry Amish Furniture’s website.